The Hippie House Presents Step Jam no. 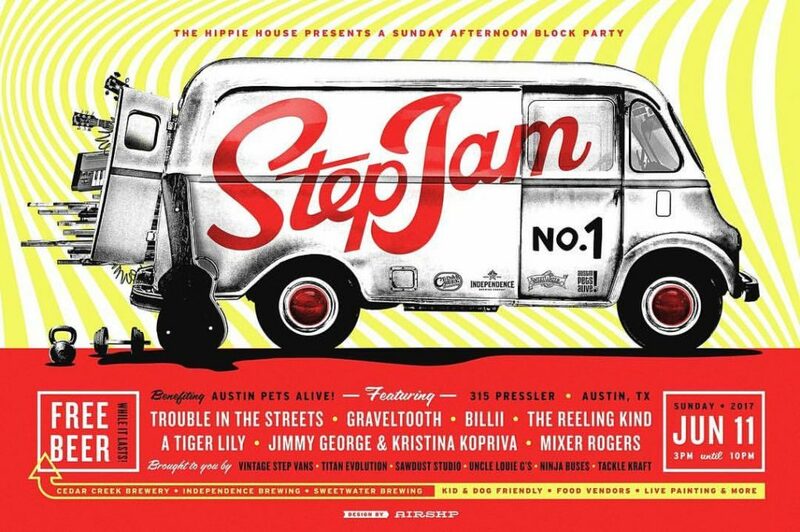 1, the very first in a series of Step Jam events where local businesses join forces with Austin musicians, artists and foodies to raise money for a local charity. Join The Hippie House and friends this Sunday, June 11th, for an afternoon block party at Pressler Place (315 Pressler, Austin, Texas) benefiting one of a favorite furry friend allies and non profits, Austin Pets Alive! This is not your average Sunday block partie, however, because this one features a top-notch musical menu, free delicious beer from various breweries (while supplies last!) a wide array of local craft vendors and entertainment for every two-legged and four-legged friend alike! Admission is free with RSVP but a $10 suggested donation is encouraged. All proceeds go to our friends at Austin Pets Alive!